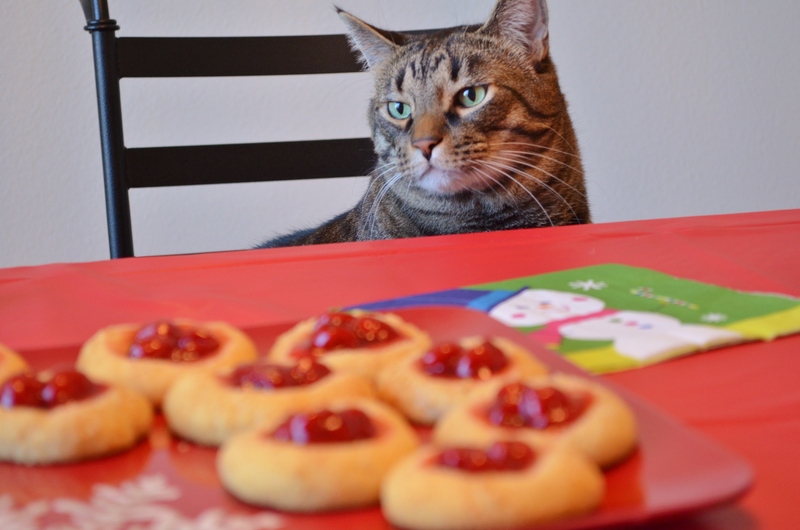 Christmas is quickly approaching and you know what that means… Cookie season!!! Holiday dessert tables always have cookies and are adorned year after year with the traditional family favorites. These favorites typically include sugar cookies, gingerbread men, and anything peppermint infused. I love all of these but sometimes you just want something fresh and new to try. That is why each year alongside the traditional cookies, I always make sure that I add one new cookie to the platter that everyone can try to enjoy alongside the usual favorites. It is from that tradition that I created my annual dedication to diverse holiday cookie options in the month of December. 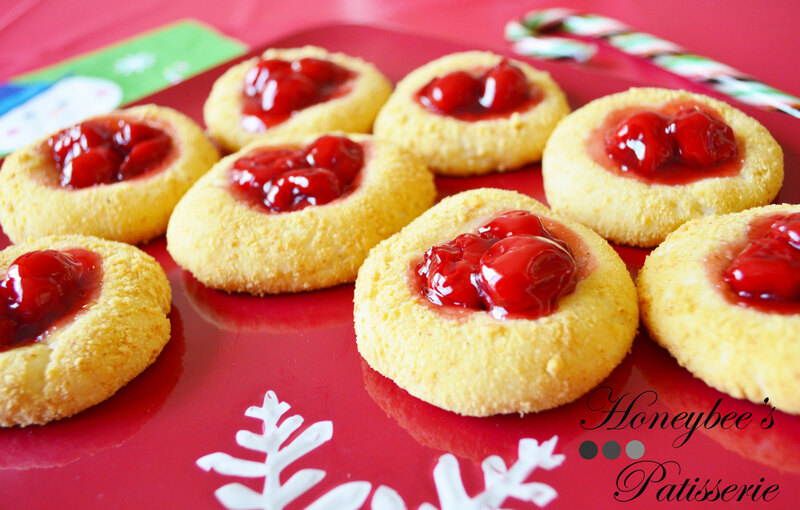 For the next few weeks you will be seeing many posts on cookies that I find can be a great addition to any holiday dessert table. 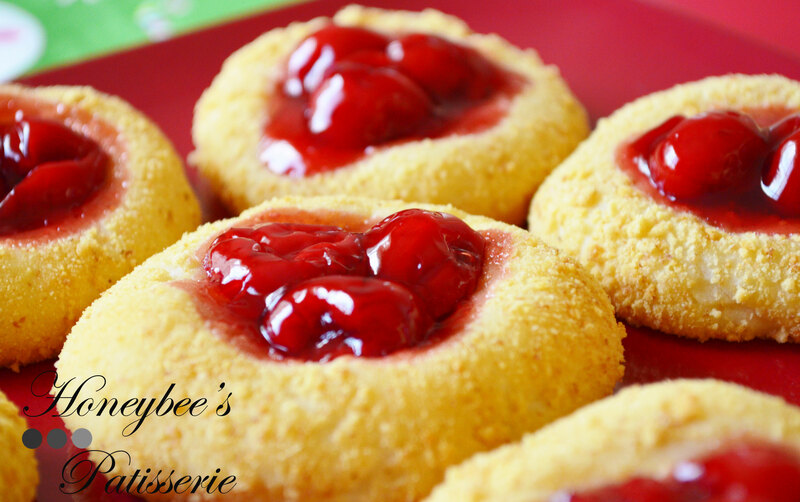 I started this year with Cherry Cheesecake cookies. These cookies have been sweeping the social media airwaves as of late but I actually came across this cookie back in 2010 and fell in love. 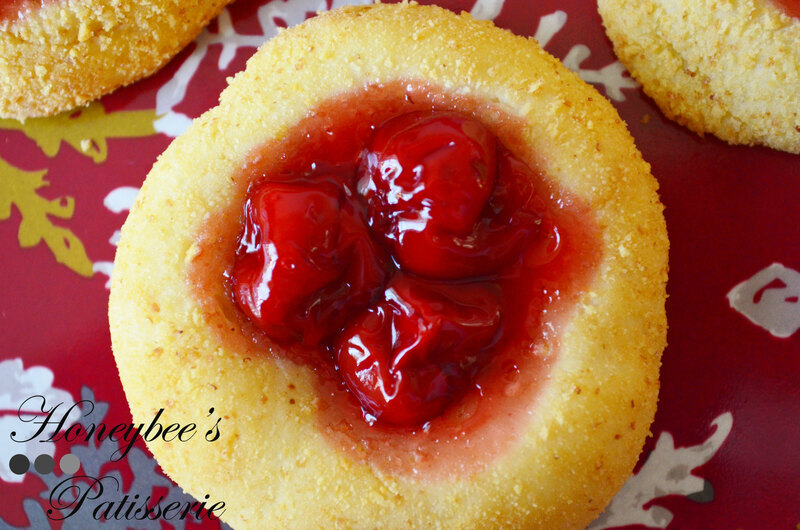 Cherry cheesecake was always a favorite of mine as a kid and melding those flavors into the portable ease of a cookie is heavenly. I like to make the cookie dough ahead of time not only to save precious time for baking other things but also because these cookies do not have a very long lifespan after they have been baked. It is best to make them the day they are going to be devoured because the cream cheese filling causes them to spoil at an accelerated rate. Also the extended chilling time will make it much easier to shape and roll the dough balls in the graham cracker crumbs. The formula I use makes about 2 dozen cookies and is enough for my family at the holidays, but if you have a larger family you can certainly double the recipe. Once the cookies have been baked be sure to store them in an airtight container for no more than 2 days. Mix the flour, baking powder, and salt in a bowl and set aside. In the bowl of a stand mixer fitted with the paddle attachment, beat the cream cheese, butter, and sugar together on medium-high speed until the texture becomes smooth and creamy. Add the eggs and vanilla and mix until combined. Reduce the mixer speed to low and add the flour mixture. Mix the dough together until it is incorporated. Do not overmix. Refrigerate the dough overnight. Heat the oven to 350°. Line 2 baking sheets with parchment paper. Place the graham cracker crumbs in a small bowl. Place the cherry pie filling in a shallow dish. Remove the dough from the refrigerator. Roll the dough into 1 inch balls and then roll in the graham cracker crumbs. Place the dough balls 2 inches apart on the prepared baking sheets. Use the back of a tablespoon to make an indentation in the center of each dough ball. 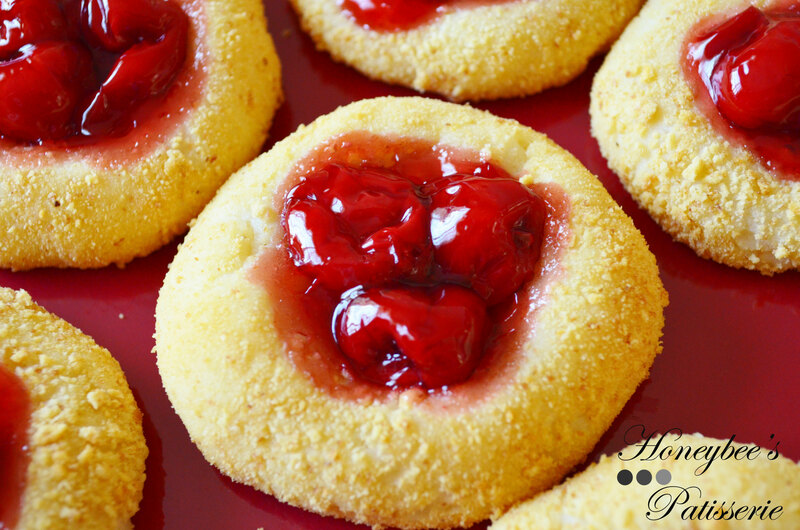 Use a small spoon to place 3 cherries in the indented center of each cookie. 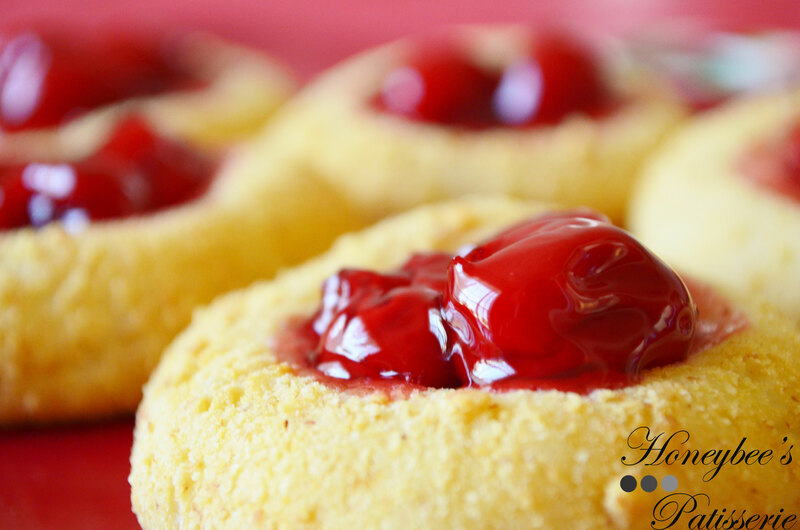 Be sure to strain off as much of the filling/juice to ensure the cherries do not end up swimming in a cherry bath and creating a soggy-centered cookie. Bake the cookies until golden around the edges, about 12 to 15 minutes. Be sure to rotate the pans halfway through the baking time to ensure even cooking. Cool cookies on the baking sheets for 5 minutes, then transfer to a wire rack to cool completely.